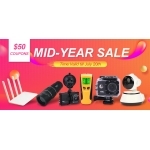 The Newfrog Mid-Year Sale is on with up to 82% off home & office, car, sports & outdoors accessories. Free UK Delivery. The promotion is valid online until 20 July 2017.